Why Do I Need Grease Containment? Your exhaust hood is dirty, and you’re pretty sure your rooftop grease containment isn’t doing much containing right now. Hate having to take the time find a contractor, make the call (and hopefully get them on the phone) then schedule a service time every single time you need maintenance? It’s a chore! We want to make it easy for you. That’s why we provide a convenient maintenance program. A customizable service that combines hood cleaning and rooftop grease containment services. Typical service includes a regularly scheduled cleaning, including checking for any damages or needs for repairs. We are trained and experienced in servicing all types of hoods, filters and rooftop grease containment systems. We service kitchens as well as industrial and manufacturing facilities. Set up a maintenance schedule one time, and we’ll send our professionals on time, every time after that. No hassle. Why enroll in our maintenance program? The best way to prevent deterioration of your roof and other issues that come from a build-up of grease left unchecked is through maintenance. Save money by preventing costly system and structural repairs. 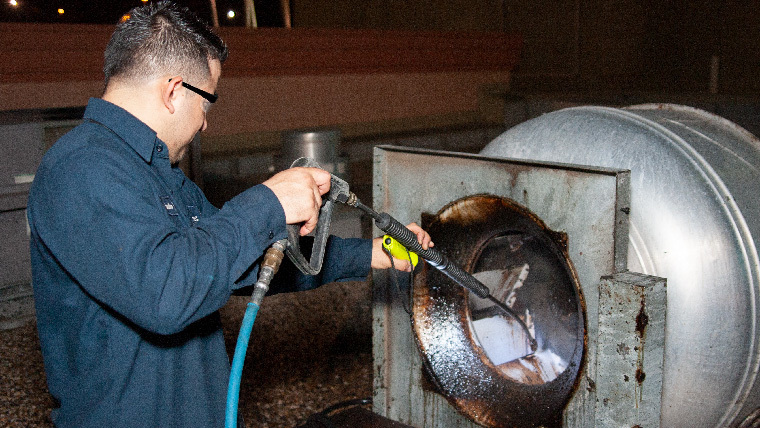 Save time with regular maintenance of both the hood and rooftop grease containment systems. No hassle convenience with a pre-arranged schedule that can be paid at the time of service, or through monthly billing. Always our reliable team – never a subcontractor – so you can be assured the quality of service will always be excellent. Is our maintenance program right for you? Still not sure if our maintenance program is right for you? Give us a call! We’d be happy to see how we can better help with your needs. At Facilitec West we provide service with results. We take responsibility for our role in your fire prevention. If you are ready for peace of mind from having our expert team service your hood and rooftop grease containment system, call 888.463.2293.